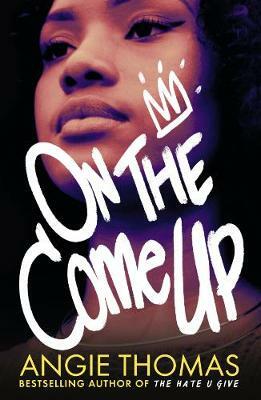 Waterstones Children's Book Prize-winning author New York Times #1 bestselling author The award-winning author of The Hate U Give returns with a powerful story about hip hop, freedom of speech - and fighting for your dreams, even as the odds are stacked against you. Bri wants to be one of the greatest rappers of all time. As the daughter of an underground hip hop legend who died right before he hit big, Bri's got massive shoes to fill. But when her first song goes viral for all the wrong reasons, Bri finds herself at the centre of controversy and portrayed by the media as more menace than MC. And with an eviction notice staring her family down, Bri no longer just wants to make it - she has to. Even if it means becoming the very thing the public has made her out to be. I LOVED The Hate U Give. It was probably one of my favourite contemporaries of 2017 because it made me think. It was real, unlike anything I’ve ever read before and I was crying by the time I reached the end. Angie Thomas is a gifted writer and she deserves every bit of the love that has come her way. I read On the Come Up in three days. At times, it was a hard book to read because of the reality of what teenagers with low income backgrounds, like Bri, have to face. At other times, it inspired me, through Bri's dedication, spirit and her rap/lyrics that played an integral part in the book but most of all, it was a thought-provoking book about following your dreams, written with a heavy dose of reality and I loved it. Seriously, if you loved The Hate U Give, you’ll love Angie Thomas’ sophomore novel as well. THINGS I LOVED: THE LYRICS: Bri’s lyrics were BRILLIANT. I loved them, how she put them together and how Angie Thomas wrote it all. The part about ‘You can’t spell brilliant without Bri’ was a TAD CHEESY, but in all that real talk, I’ll take it. THE FRIENDS: I quite loved Bri’s friends, and even Miles (without a Z) towards the end. They, just like her family, were fun, real and I loved that at the end, they were always there for each other. THE BATTLES: I think the battles that Bri had, especially the first with Milez was SUCH BRILLIANT PLOTTING/ WRITING. I was GLUED to the page as they took place and found it hard to extract myself after. THINGS I DIDN’T LIKE: It honestly felt like a lot of the dialogues were repeated across the book. There was a particular point when Bri was studying with a guy (that I will not name because SPOILERS) and both her mom and brother come in at different intervals and say something along the lines of “This isn’t studying, and I ain’t got no time to be a grandmother/ uncle” and while I understand that it was meant to be funny, I found it a little repetitive. WOULD I RECOMMEND THIS BOOK? HECK YES. I absolutely loved reading every second of it and you should definitely dive into BOTH of Angie Thomas’ books if you haven’t already.